A free copy of STACK LIST, the most comprehensive list of the best nootropic stacks in the world (PDF VERSION). A free copy of the Racetam Course – the VIDEO STREAM Course that teaches you about ALL THE MAJOR RACETAMS, and gives INSANE STACK BREAKDOWNS. You’re getting 3 INSANE products at once. The Cortex stack is a strong, FOCUS, MOTIVATION, AND VERBAL FLUENCY nootropic stack. Stack List is a digital PDF guide, that lists the most powerful nootropic stacks on the planet. 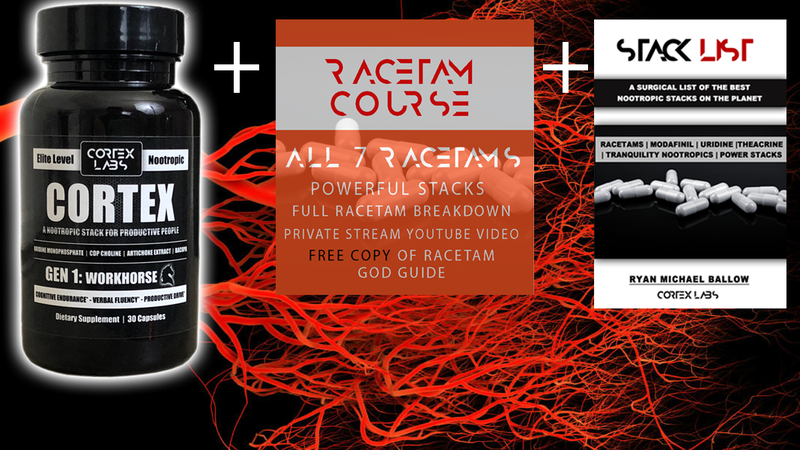 The Racetam Course is a 1 hour video stream of Ryan, breaking down all major racetams, how they work, how to take them, and powerful racetam stacks with each racetam. We will process your order and SHIP your bottle of Cortex to you today, or the next working business day!